There might have been a few unpublishable words, too. Oh well. It is very easy to explain. 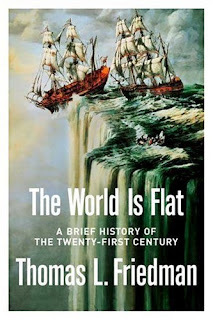 If by reading a book a reader gets into a conversation with the author, each time I'm reading anything by Thomas Friedman we're having a blazing row. And when it comes to intellectual matters, there are few things I love more than a blazing row. I love Friedman's writing style. I can't help admitting that when it comes to pure writing skill, he's damn, damn good - articulate, colourful, opinionated. It's just that I completely don't agree with his opinions. To me, he's just a propagandist for the American power politics, and since I'm neither American nor particularly power-hungry, I just can't tune into the world seen through his eyes. I don't want to get carried away into politics (and earn a possible lawsuit in the process) so I won't go into any detail as to what exactly made me froth in The World Is Flat. Let me just say that I wouldn't vote for this party and leave it at that. Still, the book itself is good. It's about globalisation, world economy, capitalism, politics and big business. It's about cheap labour and how it can be used. It's about technological inventions that were cutting edge when the book was published, but since that means 2005, they aren't so cutting edge anymore. 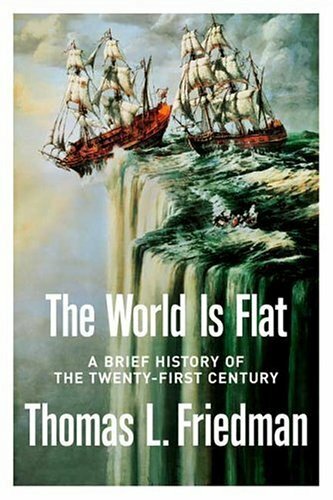 In the fast changing world of today you can actually consider The World Is Flat a history book, all the more interesting because we've lived through this history. One more thing - if you can spare the time, have a look at my previous post, a review of 23 Things They Don't Tell You About Capitalism. My reading it right before The World Is Flat was not intentional, but I found contrast between the two enlightening. It's like comparing two different versions of reality. A powerful reminder that in politics and economy there is no Truth, there are just Opinions.